Genocide, Gaza, and Godwin’s Law. It’s the one Hamas hopes to perpetrate on the Jews. 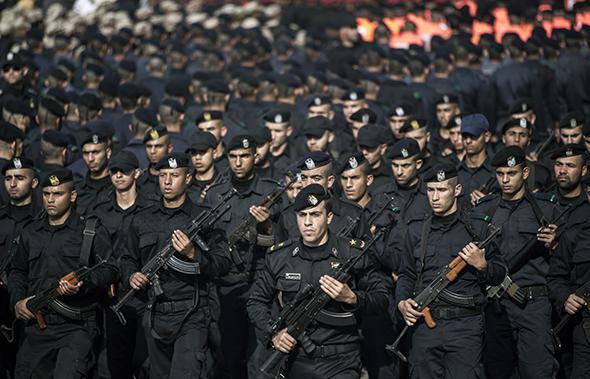 Hamas security forces during a military parade in Gaza city on Jan. 13, 2014, marking the fifth anniversary of the last Israeli offensive on the Gaza Strip. That is, it will lead to scolding the purists as “grammar Nazis.” In that relatively mild—though all the more excessive—mold, we’ve recently seen those who compared Big Gulp soda bans to Nazi dictates shamed for violating Godwin’s Law. And in the literary world there was that novel whose title was modeled on Hitler’s Mein Kampf that aroused more wonder than outrage. What an innocent time that was just a few months ago. Suddenly, though, things have gotten far more serious on the Godwin front, as Nazi, Hitler, and genocide analogies have invaded geopolitical discourse with the force of a blitzk … I mean with great force. They come in the form of hashtags that compare Putin to Hitler, Israelis to Nazis, and Gaza to genocide; and slogans, often accompanied by swastikas, on demonstration banners. Israelis get it both ways in some of these demos: compared to Hitler’s Nazis (i.e., they are very, very bad) and at the same time told that #HitlerwasRight (Hitler: very, very good). But even Israelis themselves are divided about the legitimacy of Hitler and Holocaust comparisons. Months before this Gaza war, the Israeli legislature, the Knesset, was arguing over a proposed law that would have turned Godwin’s Law into real legislation: a bill that would make it illegal to use Hitler or Nazi or Holocaust comparisons in public debate because such use inevitably trivialized the horror of Hitler’s mass murder. The bill failed to become law. Meanwhile Hamas supporters evidently feel maximalist claims like “genocide” (#GenocideinGaza is a popular hashtag) are necessary to get the world’s attention, raising the question of whether disproportionate comparisons subvert themselves. It all goes to show what a morass we enter when Hitler, Nazis, and genocide are used by either side in a conflict. (Here in the U.S., the Tea Party pioneered the recent renaissance with Hitler mustaches painted on Obama images.) And it raises the question of whether Godwin’s Law has lost the theoretical ability to restore order. 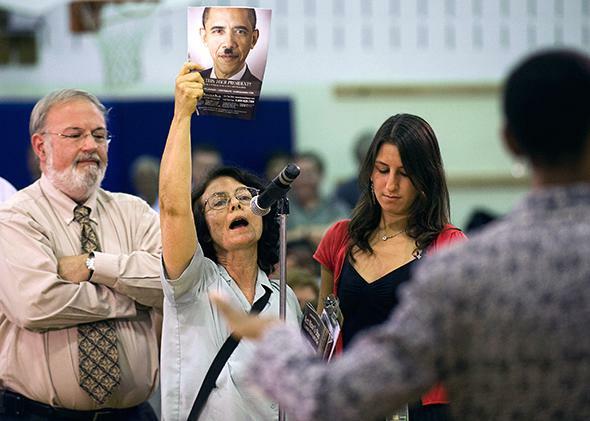 A woman holds up a picture of U.S. President Barack Obama depicted as Adolf Hitler during a health care forum in Germantown, Maryland, in 2009. There’s an important distinction here because the formulation makes clear the original “law” is descriptive, based on empirical observation—much like a law of nature—rather than a law of the justice system or speech code prohibitions, as it is all too often taken. It’s descriptive rather than prescriptive although, it’s true, a sardonic measure of disapproval seems built into it: the implication that the ultimate descent to Hitler and Nazi comparisons inevitably trivializes these depths of evil. On the other hand, can it be interpreted too restrictively? Now it happened that in the afterword to the new edition of my book Explaining Hitler I had devoted a section to a critique of the blanket, prohibitory restriction of language for which Godwin’s Law is often invoked. “No Hitler analogies then?” I had asked. “Yes they can trivialize, but on the other hand a blanket, ironclad rule, removes them from significance in current discourse entirely.” Removes Hitler and the path the Nazis took to war and genocide out of history, from referentiality. Removes a dark polestar, one might say, by which we measure the degree of evil. Makes it more difficult to put lesser evil in perspective. Prevents us from learning anything from that dark episode by refusing to make it “relatable” (a word I didn’t use). An example: One could well object to Prince Charles’ impulsive recent assertion that Vladimir Putin was “about the same as Hitler.” (Perhaps “no genocide, no Hitler analogy” should be the rule.) On the other hand, it may not necessarily be prima facie invalid to say that Putin’s maneuvering in eastern Ukraine, stirring up the Russian-born speakers, is not dissimilar to the tactics Hitler used in the campaign to stir up the Sudeten Germans in Czech territory to agitate for reunion with Germany (something Neville Chamberlain ultimately acceded to at Munich in 1938). It’s a mistake, I argued in my book, to put Hitler and the Holocaust in some sacrosanct space so that we can learn nothing from them about any other episode of human behavior. Or about the extreme but real potential for evil of human nature which should not be underestimated. What happened next—shortly after publication of an excerpt from my book that included this discussion—reminded me of the Marshall McLuhan movie-line moment in Woody Allen’s Annie Hall. I was contacted by Mike Godwin himself, author of the law. He didn’t exactly say, as McLuhan did, “You know nothing of my work.” But he did question whether I was saying his law set forth an “ironclad” or “blanket” prohibition of Nazi and Hitler analogies. He wasn’t in the prohibition business—indeed he told me he was an early staffer for the Electronic Frontier Foundation, which defends free speech rights and hacker culture in the digital age. I assured him that I too was taking issue with people who misinterpreted Godwin’s Law as an ironclad prohibition. We had a productive email exchange in which we both agreed that Godwin’s Law should be taken less as prohibitory than as cautionary. There remained the question of how to craft the caution sign? In many cases it’s going to be a subjective judgment and no agreement can be reached. So I would like to focus on one overused analogy word: “genocide,” a word I first found cropping up in hashtags on Twitter such as #GenocideinGaza, and in overheated online “discussions.” I think there is a case to be made that this use of “genocide” violates the essence of Godwin’s Law, the heart of which is that comparisons to ultimate evil are all too often used carelessly. 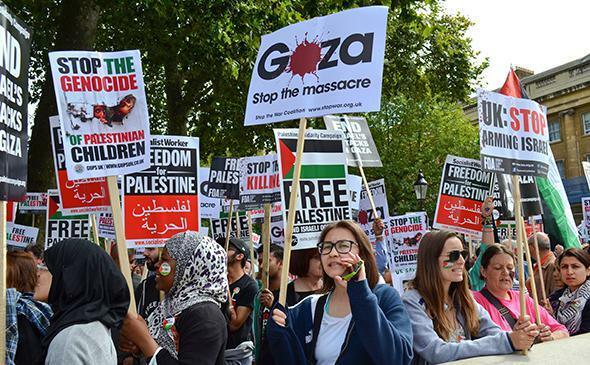 Demonstrators gather to protest Israeli attacks on Gaza, in London on Aug. 23. All death in war is horrific. The death of civilians more horrific, and the death of children even more than that. But wars happen, civilians die, and distinctions are made between directly targeting noncombatants and attempting to avoid noncombatant casualties. Genocide is genocide and not something else. As defined by the United States Holocaust Museum, genocide is “a very specific term, referring to violent crimes committed against groups with the intent to destroy the existence of the group.” Destroy the existence, not merely violate its rights or engage in combat. The man who invented the word genocide, Raphael Lemkin, spent years getting international organizations to accept his definition, which emphasized that genocide meant eradication or attempted eradication of a group. The 1998 Rome Statute of the International Criminal Court on genocide (which the United States has not ratified) adopted a definition of genocide that distinguished it from crimes against humanity, war crimes, and criminal aggression. All bad, but not all genocide. Again, the goal of genocide means the goal of total eradication. So where do we find actual genocide in Gaza, away from the hashtag? Let’s look at the Hamas “Covenant,” the founding document published in 1988 and unchanged since. It’s fascinating how central this document is—or should be—to the Gaza conflict, and yet how absent it is in most discourse. It was published a quarter century ago in 1988. It’s been available in translation for as long as I can remember, now easily accessible online in a Yale Law School Library translation. Israel will exist and will continue to exist until Islam will obliterate it, just as it obliterated others before it (The Martyr, Imam Hassan al-Banna, of blessed memory). There is no equivocation. There is just “obliteration.” Not explicitly genocidal, it could be argued that it’s just metaphorical—that the destruction of Israel will somehow not involve any harm to the vast majority of 5 million Jews there, just the state of Israel. This was the dodge Holocaust denier Mahmoud Ahmadinejad used when he spoke of wiping Israel off the map. 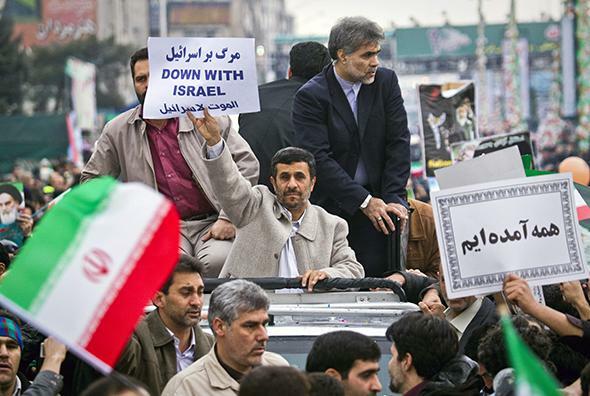 Former Iranian President Mahmoud Ahmadinejad holding a placard in Tehran in 2011. OK, let’s concede that metaphoric possibility. But then we must contend with the truly sensational and horrific—and explicitly genocidal—element of the Hamas Covenant: Article 7. The article that is an explicit call for the extermination of all Jews. An explicit call for genocide. “The Day of Judgment will not come about until Moslems fight the Jews (killing the Jews), when the Jew will hide behind stones and trees. The stones and trees will say O Moslems, O Abdullah, there is a Jew behind me, come and kill him. Only the Gharkad tree … would not do that because it is one of the trees of the Jews. Somehow I think Jews shouldn’t rely on the Gharkad tree. The language calls for the mission of Hamas to be to seek out and find every Jew wherever they may be hiding and kill him or her. No Day of Judgment until that is done. It continues to shock me that a group with an overtly genocidal mission written into its covenant for a quarter century now, is somehow treated as a legitimate participant in the world’s diplomatic processes. A potential “partner for peace.” Talk about a flawed moral equivalence. The quotation is from what is known as a “hadith,” a non-Quranic saying of the Prophet, and according to scholars I’ve emailed with (both Islamic and Jewish) it’s important to remember that some hadith are more directly connected to the Prophet than others. What the scholars point out is that Hamas has deliberately chosen a hadith with an explicit anti-Jewish message for its very reason for existence. And it’s important to emphasize that the “kill the Jews” message of the hadith does not represent the viewpoint of mainstream Islam. Still it’s scandalous to me that those who write about the Gaza conflict do not make clear that this is not incidental to Hamas but the entire purpose of its being. Its sacred mission. You want to talk about Hitler analogies: Even Hitler never became that specific in Mein Kampf. Many scholars believe that Hitler gave the wartime extermination order orally, although in a 1939 pre-war speech, he pledged himself to the “destruction of World Jewry”—a speech that was not taken literally by most of the world. Compared to Hamas, Hitler was cautious, politic. Of course he wanted to exterminate the Jews, but he didn’t write it into the constitution of the Third Reich. So there it is for all the world to see. The real #GenocideinGaza. Still a dream, true, but a dream that could well come true. It’s not as if it would be an unimaginable task to murder another 5 or 6 million Jews just over the border. The thousands of rockets Hamas has fired at Israel since they took over Gaza—rockets that tried and (mostly) failed to kill noncombatants—could easily become far more deadly and sophisticated. If their dreams come true, maybe tactical nukes. 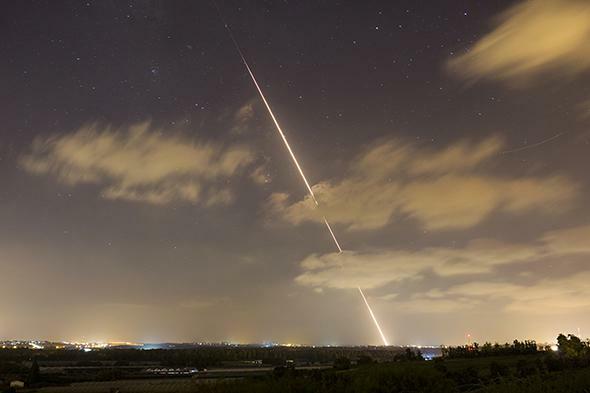 A rocket is launched from the northern Gaza Strip toward Israel on Aug. 21. For a quarter century now this genocidal Hamas pledge has been there for the world to see. Genocide, not some metaphor, not some Godwin’s Law–breaking comparison, but genocide—a mission statement. I find the unwillingness of the world to take this into account, to take it seriously, to understand the Israeli response to it, the Israeli rage generated by genocidal threat that dictates what to some—including myself at times—may seem a disproportionate response, is probably the most telling disconnect between the reality and the reporting on the Gaza conflict. Because believe me, the Israeli people are not ignorant of the Hamas Covenant, they are not unaware of its seriousness and the consequences thereof. Some foreign Hamas supporters try to play down the covenant or—seriously—say it should be of little concern. True it has been there for a quarter century from the very founding of Hamas and no Hamas leader has renounced it. And at its heart is a command from the Prophet with the very day of judgment at stake in the success of the genocidal mission. But one (Jewish) defender of Hamas told me not long ago, the genocidal imperative should just be regarded as if it were boilerplate rhetoric and, besides, he said, Hamas was only really concerned with murdering the 5 million Jews of Israel, not all Jews in the world. I believe he thought I would find this reassuring. Of course it must be said that, shamefully, one extremist American Jew wrote a column appearing in the Times of Israel to advocate genocide (which, however quickly it was taken down, cannot be unsaid or excused). * But contrast the shame expressed across the board by Jews in Israel and abroad with the fact that Hamas’ call for genocide has been enshrined as the very heart of the “Definition of the Movement.” The Hamas call for genocide was an official position of a group seeking international respect. True, several nations have declared it a terrorist group. But even terrorism is not (always) genocide. As for Hamas even acceding to Israel’s right to exist, that same Jewish defender of Hamas claimed that Hamas had offered Israel a “hudna,” the Arabic word for temporary truce once Israel had met some nonnegotiable demands. But a hudna is not toleration; a hudna is a truce in a war that will eventually continue, Hamas’ war for a Final Solution. It is only if contemporary discourse on events in Gaza take the words of the covenant into account that the events can be understood. Apparently the world is content to ignore the fact that the Hamas Covenant is, in and of itself, a war crime. (A war crime, not yet a genocide.) Apparently the various moral equivalence explainers are unaware that advocating genocide is a punishable war crime, different only in degree from genocide itself. Indeed the International Criminal Tribunal for Rwanda convicted the perpetrators of a Rwandan radio station of crimes against humanity just for its broadcasts inciting the murder of the Tutsis as that genocide (yes, genocide) got underway. Though neither party is a signatory to the Rome Statute on Genocide, I wouldn’t be opposed to that idiot Jewish advocate of genocide being hauled before the International Criminal Court. As long as the entire leadership of Hamas was there in the dock, too, for advocating genocide in their covenant. Because of course the entire governing entity of Hamas is prima facie guilty of advocating genocide. But the ignoramuses comparing Israelis to Nazis and Gaza to genocide while ignoring actual ongoing genocide in Syria and Iraq must be seen as an excrescence of the enduring double standard to which Israelis—and Jews—are subjected. 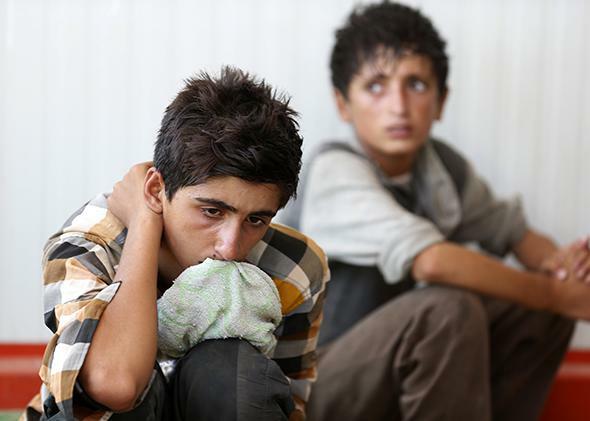 Displaced people from the minority Yazidi sect, fleeing the violence in the Iraqi town of Sinjar, Aug. 14. Everyone debates the line between anti-Zionism and anti-Semitism. I think the #GenocideinGaza analogists have shown us one place it can be found. Those who use it give themselves away. Perhaps the #GenocideinGaza analogizers don’t realize what a hideous distortion of history they perpetrate. Perhaps they don’t realize that what they are doing is, to my mind, the moral equivalence of Holocaust denial, certainly an abject ignorance of Holocaust reality. Holocaust reality: Indeed there are those of us who have spent years thinking and writing about it who can lose sight of it. Lose touch with it. Who wants to stay in touch with it? Yes, W.G. Sebald has told us “No serious person thinks about anything else.” But this was hyperbole. He didn’t mean we don’t think about lunch or dinner. It means we ought, if we’re serious, to keep in our minds what it said about human nature and human potential—the human potential for evil. And yet it’s true that we sometimes feel numbed, sometimes feel “Holocaust fatigue,” sometimes need reminding of the uniqueness of that six-year-long horror. I actually feel that for many, the reality of it all has faded into the abstract number of 6 million with little sense of who the killers were except that one bad guy with a sniper rifle in Spielberg’s Schindler’s List, or Bruno Ganz in the Downfall parodies. The ill-conceived phrase “banality of evil” has blinded many to the vile, feral totalizing nature of the evil perpetrated 24/7 in the death camps. The fact that Eichmann boasted he “would go to his grave laughing with the death of 5 million Jews on his conscience.” The fact that even when the war was lost, even when Himmler was trying to end the killing in order to have enough live Jews to trade for some kind of amnesty, Eichmann pursued the remnants of the Hungarian Jewish community, with a vile vengeance, making sure everyone could be fed into the disintegrating industry of death. 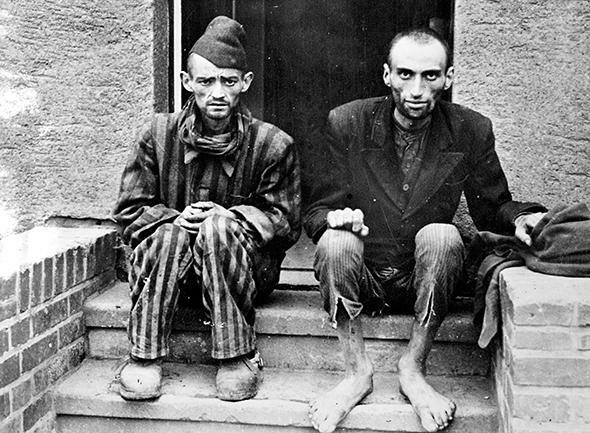 World War II Survivors of the Dachau concentration camp at the arrival of the U.S. Army, April 1, 1945. How nice it would be if all evil could be dismissed as “banal.” I know I’ve experienced “Holocaust fatigue” and don’t like to be constantly reminded of genocide’s past and future. It was something I realized when reading the galleys of Martin Amis’ forthcoming novel The Zone of Interest, set in Auschwitz. Amis has written brilliant satiric novels, but he has also repeatedly returned to the question of evil, battering at the door to darkness—in Time’s Arrow and The House of Meetings (his novel about the gulag) and Koba the Dread his meditation on Stalin and Stalinist genocide. The Zone of Interest is by far his most successful attempt to grapple with the hideous granularity of the death camps—the dailiness of Auschwitz. And in reading it, I found myself taken aback by the horrid specificity, the unrelenting description of the stench of industrialized murder. The landscape of Auschwitz, the fields of suppurating corpses buried beneath them, the swampy shallow graves where corpses were left to rot—once their gold teeth had been removed with pliers—during the many periods when the gassing outran the capacity of the crematoria and even the ad hoc death pyres sending human smoke to the skies. The way the fields of corpses would move and emit small geysers of corpse gas. I believe Amis has made a remarkable breakthrough here. He has painstakingly—and successfully—restored the power to shock—to remind us of what we’ve insulated ourselves from. Amis manages, through “thick description” of the routines of Auschwitz, to make unrelatable evil “relatable” through the mindsets of the evil doers. I have one suggestion for those who use Gaza/genocide analogies to flout Godwin’s Law, those who are too far gone to read Primo Levi or Tadeusz Borowksi for instance; those who don’t have the patience to sit through Claude Lanzmann’s Shoah. They should try getting through the new Amis and not getting sick on themselves with shame for the way they’re using the genocidal libel to inflame the fires that will murder more Jews. Read more on the Israel–Gaza conflict. Correction, Aug. 26, 2014: This piece originally misstated that an Israeli wrote a column in the Times of Israel advocating for genocide. The author of that column was an American Jew. The piece also misstated that Hafez al-Assad, not Bashar al-Assad, is responsible for the murder of an estimated 150,000 Syrians.